my foot is throbbing. why? because when i was walking out of the bathroom a staple jammed into my heel. who on earth in this house is stapling things in the bathroom? i think i need to go eat some of this cake. not the store-bought pre-sliced bundt cakes that always show up at strange family and friend gatherings. no. each layer tastes like its own. sour cream keeps the crumb dense but super moist. look at these colors. it looks like an ice cream shop and summer. 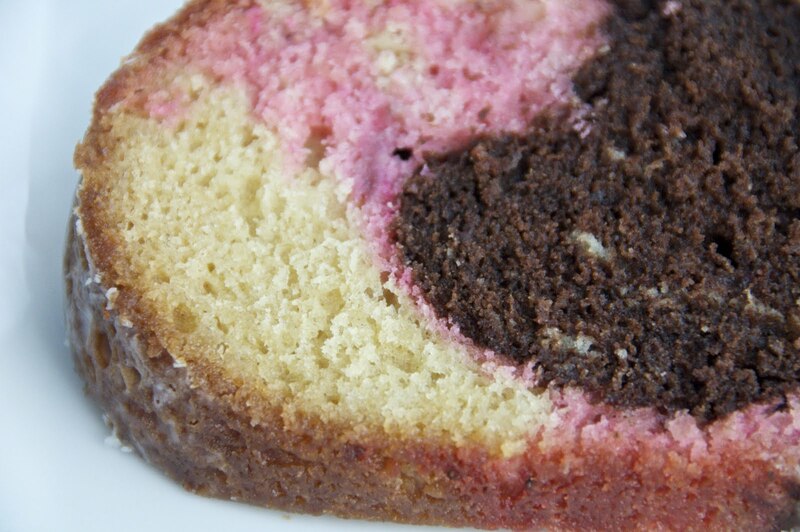 neapolitan marble cake. (!) more awesome. make chocolate swirl: in the top of a double boiler over simmering water or in microwave, melt the chocolate. when it's completely smooth, add the cocoa powder. remove from heat and set aside. preheat oven to 350. spray the inside of a 10 inch bundt pan. sift the flour, baking powder, baking soda, and salt. 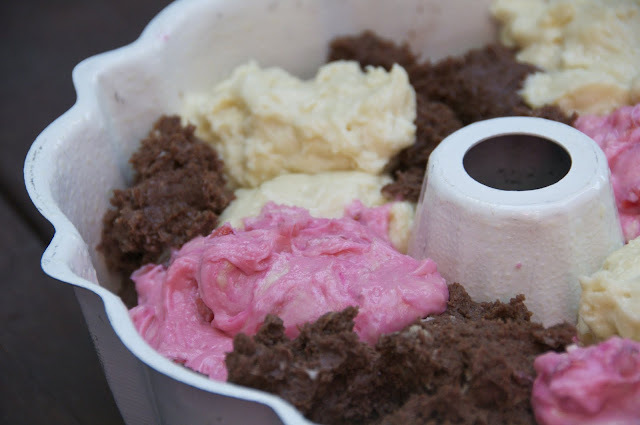 in the bowl of an electric mixer fitted with paddle attachment, cream the butter until smooth. scrape down the sides and add the sugar. beat until smooth and fluffy. add the eggs, one at a time, beating well after each addition. scrape down bowl and mix. add the sour cream and vanilla and beat until just incorporated. add the dry ingredients in 3 additions. do not overmix! pour 1/3 of batter into the chocolate and combine. fold strawberries and preserves into another 1/3 of batter. plop large spoonfuls of 3 batters into pan. then use a butter knife to pull through the layers and make swirls. bake in the center of the oven for about an hour, rotating halfway through. let cake cool in the pan for a bit and then invert. eat for breakfast, lunch, and dinner. Why have I never seen this ever before? 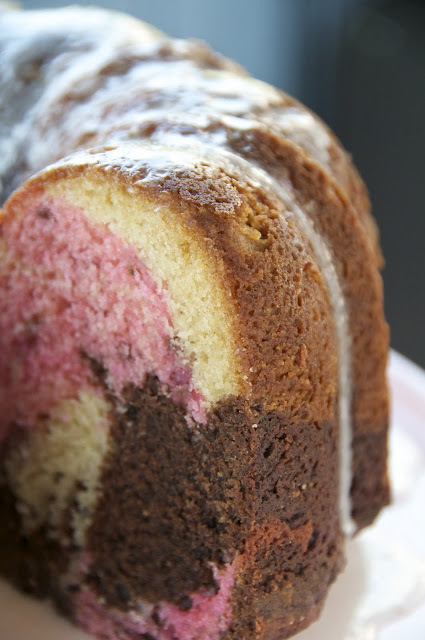 It seems like the perfect way to make Bundt cake ... and there are so many flavor combinations! Lotz & lotz. I'm excited to try this. Thanks for the awesome inspiration. You should be a food photographer. Your pictures are awesome! This is BEAUTIFUL! What a perfect birthday cake that would be. 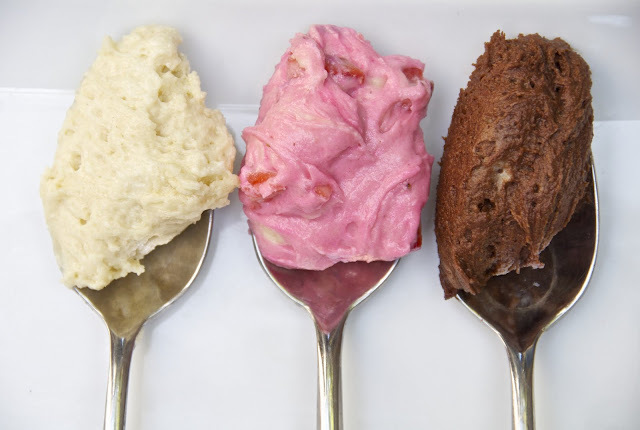 I love Neapolitan!! Your cake looks so beautiful, I definitely agree with you about the colours...they are perfect. Saw your cake on Baking Bites! Yummy-looking recipe. I will have to try it. I made this today and it tastes great. However, the strawberry part wasn't pink. Did you add food coloring to that part? It's not listed in the ingredients. Thanks. O wow! Looks awsome! I'm going to try it today. Hello, I bookmarked this ages ago and just now finally got around to baking it. It turned out fabulously! Just wanted to let you know and say thanks for the inspiration! I made this for my son's birthday - his favorite flavor of ice cream is neapolitan. It was the prefect cake and was very yummy!! Hi I love this recipe can you give please that in grams. ..thank you! ! Hi, the cake is beautiful but I tried twice and the cake sinks... please I need help... ! !